HP 3PAR virtual copy provides Point-In-Time thin-aware copy of base volume. As part of the virtual copy process, HP 3PAR software uses allocate-on-write (or redirect-on-write) method which freezes the base volume and write all new data on other disk (virtual copy disk). 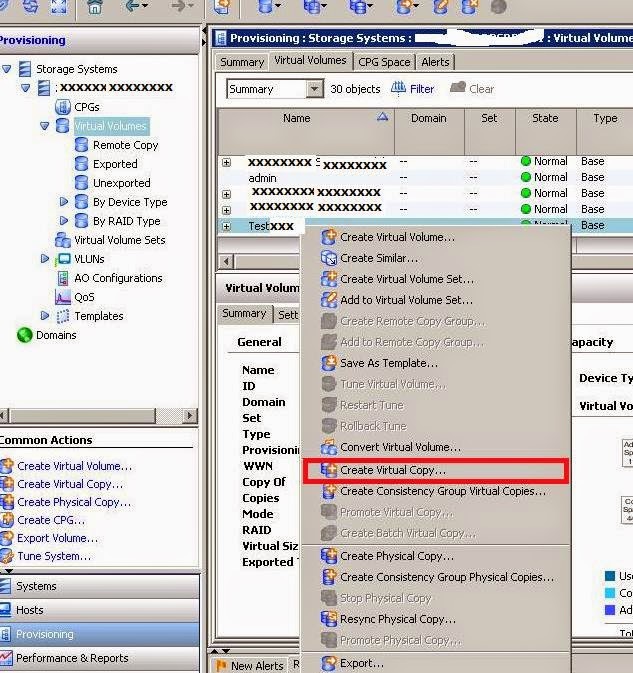 You can create Virtual copies of fully provisioned VV, Thin Provisioned VV or of virtual copy itself. There are multiple use cases for the virtual copy, for example, integration with enterprise level backup technologies, application recovery etc… Backup software vendors like Veeam, Symantec, HP, Commvault developed backup software’s by integrating HP storeServe virtual copy/ snapshot technology. 3PAR virtual copy feature is provided through “HP 3PAR Virtual Copy Software” license and it can take up to 500 PIT copies of base volume without impacting applications, up to 256 of which can be read-write copies. · In HP 3PAR console and navigate to Provisioning and select Virtual Volumes in left pane. · Select the virtual volume for which you need virtual copy and select "Create Virtual Volume"
Check parent volume and select destination volume naming convention. There are 3 types of naming convention available, so select whatever make sense to your organisation and the way you plan your snapshots. Then select whether it’s Read only or Read/Write copy. Default option is Read/Write. 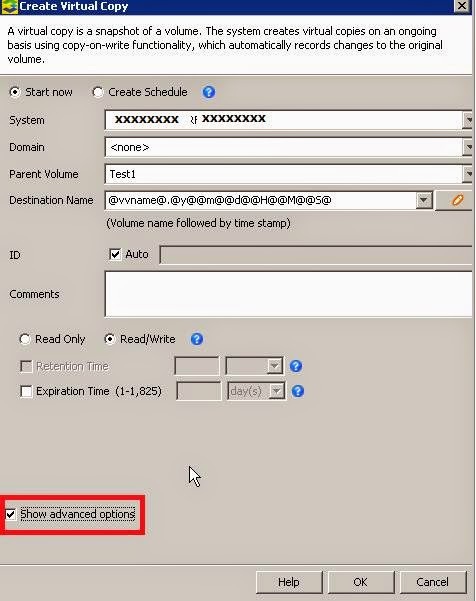 Then select show advanced options if you want to configure retention and expiration times. Be careful with retention time as system won’t allow you to delete virtual copy until retention time finishes. Generally we use expiration time, a week or a month or a year. 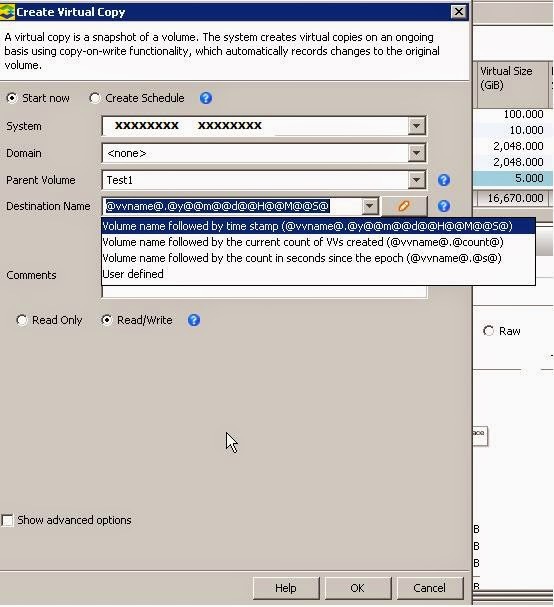 Select “Create Schedule” in above screenshot if you want to schedule creating virtual copies to a particular base volume. Just one question - I am struggling to get extra volumes listed as Parent volumes, how do you get them as parent volumes?